keep an eye out for bikes that interest me. Sometimes all three of these things happen, and sometimes only one of them does. However, one morning commute after taking my regular panda shot I came across a rider on an eye-catching steed. I liked it so much I stopped to talk with him about it. Check this bike out. Because of the wheel size and general frame shape, I initially thought the bike was a Moulton, a bike rarely seen in Washington, D.C. (unless I’m missing something). Paul, the owner, informed me that it was not a Moulton, but a One-Off. Until this day, I had never seen or heard of One-Off. Paul informed me that his custom One-Off was made by Mike Augspurger, who is also one of the founders of Merlin Bicycles. Augsperger left Merlin and started One-Off in 1989. A little on-line research revealed that One-Off now focuses on making custom off-road titanium handcycles. Here’s another shot of Paul’s bike. The chainrings are gigantic! I think the big ring is an 82. I love how the small wheels allow for the giant chainring look. It makes you look extra tough! And are those Paul brakes? I’m not a full-on gearhead so I am not sure. Sorry if I got your hopes up and I’m wrong. I was so happy to see this bike, and that Paul was kind enough to take some time to chat with me. One-Off has an interesting story and a unique product. Learning about it made for a fulfilling commute. Rules of the road followed? Check. Interesting … thanks for sharing. Originally, I thought that the chain ring could not be that big from comparing it to the front derailer and that the small wheels with 50.4 BCD spider would distort our estimate. But then again, the front derailer could be custom and I see the “82” imprinted on the chainring. So I guess that is as good of guess as any. Mind you, that is a wickedly high gearing … 82/11 ~ 7.5 * 20″ = 150″ !!!!!!!!! Geof, you have incredibly good eyesight to have noted the 82. !! 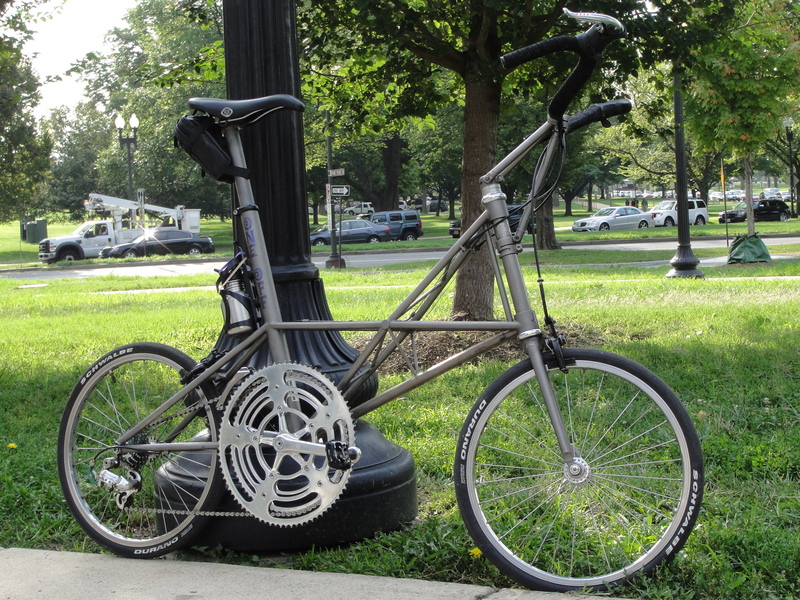 It reminds me of Jose Meiffret bike which was mounted in 130×15 . This bike was used to set a record for riding while drafting a motorized vehicle: 204,778 km/h . 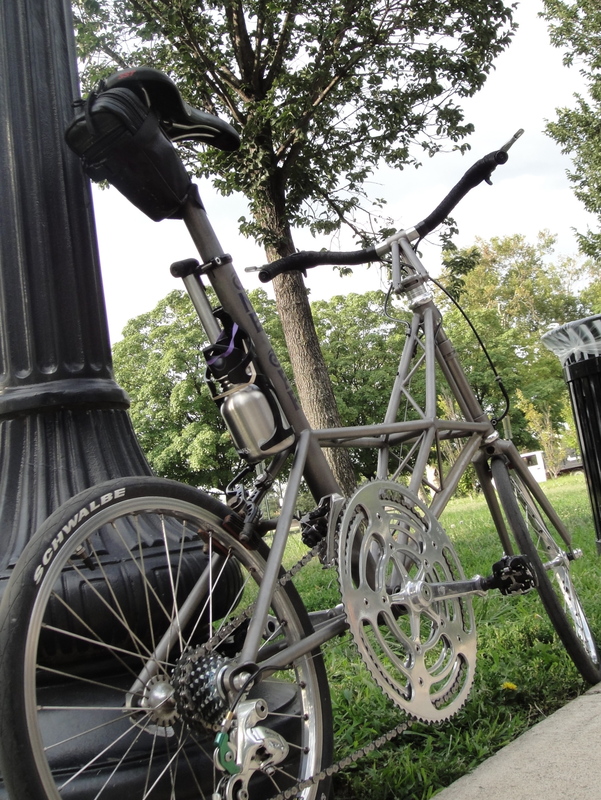 For a picture of the bike, see http://usrehoncyclo.wifeo.com/ils-ont-laisse-leur-empreinte.php . For the US, I should have written 204.778 km/h . This is a difference between USA and Canada. WOW, that is huge!!! Cool, thank you for the link. Also, the integrated rack = wow! Those are vintage Scott / Mathauser road brakes (from the 80′ies). Very cool bike, thanks for sharing.